As you all are well aware, upon the heartfelt request of all the students of the late His Holiness Kyabje Penor Rinpoche, His Holiness Kyabje Jadrel Rinpoche, through his stainless pure primordial wisdom mind, recognized the authentic reincarnation of our great beloved guru, an enlightened act of kindness that cannot be repaid even after filling the entire three thousand world systems with precious gems. However, in order to gather the boundless two accumulations for the students and for Kyajbe Jadrel Rinpoche to live long as the protector of beings and for the glory of the Buddha’s teachings, we the sangha community in Namdroling Monastery have decided to carry out Khandro Sundog (Reverting the Invitation of the Dakinis) on the 15th March, 2014 (14th day of the First Tibetan Month of Miracles) in conjunction with this year’s Drupchen/Great Accomplishment Practice according to Ratna Lingpa’s treasure teaching – Tsedrup Sangdue – the Long Life Buddha as the Gathering of All Secrets. The main purpose of this ritual is to clear away obstacles in all forms to Kyabje Rinpoche’s life. This puja will be followed by an extensive long life offering ceremony for Rinpoche’s life to remain firm like an indestructible Vajra. Therefore, for the grand success of this ceremony, we would like to appeal to all the students of Drubwang Penor Rinpoche worldwide including monasteries and dharma centres to spiritually come together on this particular auspicious day by engaging in all kinds of virtuous activities, abstaining from unwholesome actions and particularly abstaining from consuming meat, engaging in saving lives and reciting long life mantras and dharanis. All are requested to submit the number of long life mantra recitations done and also the number of lives saved on 17th March or before. Those who want to stop eating meat for life can also submit their names and those who pledge to save lives and recite long life mantras can also submit the numbers along with their names. 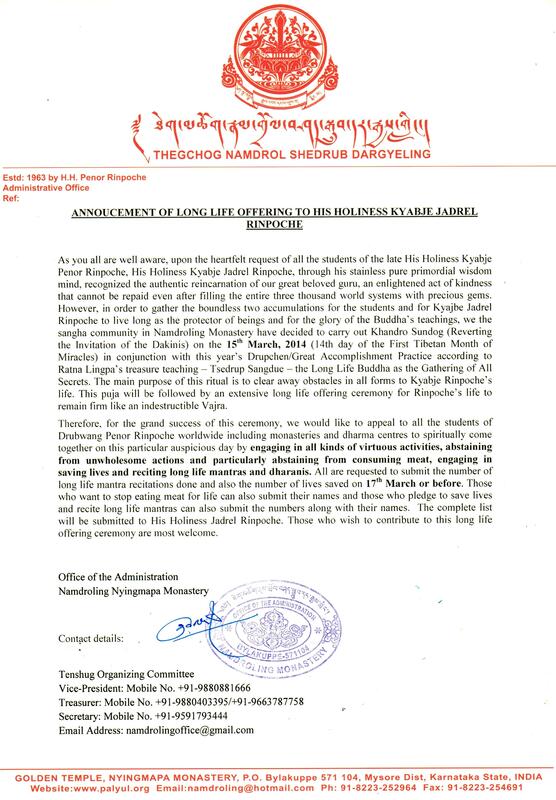 The complete list will be submitted to His Holiness Jadrel Rinpoche. Those who wish to contribute to this long life offering ceremony are most welcome. For those who wish to join the recitations, please utilize the documents below. The first is the practice text, the second is a chart for recording the practices recited. This entry was posted on Sunday, March 9th, 2014 at 22:34	and is filed under Prayers and Practice. You can follow any responses to this entry through the RSS 2.0 feed. Both comments and pings are currently closed.